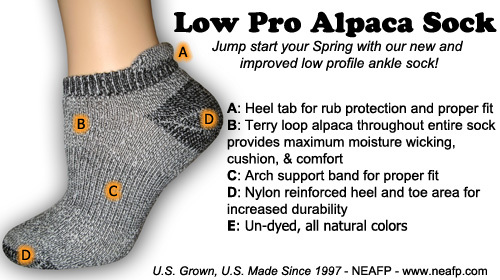 Click the button below to add the Alpaca socks low profile to your wish list. This low profile alpaca sock has alpaca terry loops through the entire sock for cushion, comfort, and maximum moisture wicking. There is a heel tab to keep the sock in place and prevent rubbing. The arch band wraps around the entire sock for a proper fit and the heel and toe have been reinforced with nylon for increased durability. Hypo-allergenic, un-dyed, and naturally odor resistant. These socks are so awesome and comfortable - we've purchased multiple pairs!